Gary Gibbs (blue) in action for Peterborough Sports Reserves against Pinchbeck. Photo: David Lowndes. Peterborough Sports Reserves fielded two stars of the club’s United Counties Premier Division title-winning squad as they took control of the Peterborough Premier Division title race with victory over main rivals Pinchbeck United last night (April 11). Forward players Josh Moreman and Mark Jones are among the top six scorers in the UCL Premier - a competition two levels higher than the Peterborough Premier Division - so their presence was a huge boost for a reserve team who had lost just twice all season anyway. Karl Gibbs (blue) of Peterborough Sports Reserves challenges the Pinchbeck goalkeeper;. Photo: David Lowndes. Moreman scored a screamer in a 4-2 win which left Sports four points clear at the top. Pinchbeck remain third, but are now four points behind with nine matches to go. Sporting Pinchbeck boss Ian Dunn made no complaints about some serious team strengthening which was within competition rules. “We took it as a compliment,” Dunn said. Ricki Goodale shot Sports in front on 20 minutes in front of a bumper PSL crowd of 120. Liam Ogden soom levelled for the visitors, but goals from Moreman and Gary Gibbs gave the leaders control of the match before the break. Andy Boome made it 4-1 after the break with the top-flight’s top scorer Ollie Maltby pulling a goal back for Pinchbeck. Action from Peterborough Sports Reserves' 4-2 win over Pinchbeck. Photo: David Lowndes. Elsewhere Stamford Lions’ 12-game winning streak in the Premier Division came to an end as they were held 1-1 at home by neighbours Ketton. In-form Luke Ball gave Lions a half-time lead, but Will Bird equalised for Ketton midway through the second half. 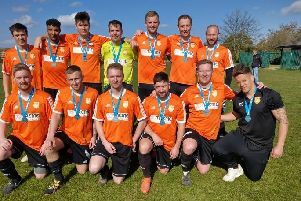 Fourth-placed Netherton United, who host Sports Reserves next Wednesday (April 19), entertain Langtoft United in a Premier Division match tonight (April 12). Premier Division side ICA Sports contest the Hunts Scott Gatty Cup Final against Cambs Premier Division outfit Eaton Socon at Huntingdon Town FC tonight. Stamford Lions 1 (Ball), Ketton 1. ICA Sports v Eaton Socon, (Huntingdon Town FC, 7.45pm).